It all started with a tweet. Well, to be fair, this has been whispered and rumored for some time now. The sudden popularity of Andromeda on the web is a clear sign that people want a singular, focused direction from Google. They want convergence. We just aren’t convinced it is what many are thinking. Don’t get me wrong, there are some compelling stories going around right now and the tweet from Hiroshi Lockheimer really caused a stir. We talked about the immensity of that tweet in a post yesterday, and since that time the internet has blown up with news about what Hiroshi could be alluding to. The conclusion? Andromeda. Android Police fired up the hype train with a piece about an internal project at Google known only as Andromeda. They go on to claim that Andromeda is Google’s project that will merge Android and Chrome OS. Further more, they reference a Wall Street Journal article from October 2015 that had inside info on a merger in the works that would be shown around year’s end in 2016 and see full rollout in 2017. To be fair, these are claims based on rumors based on a year-old WSJ story. No references outside of the WSJ article. We’ll come back to that story in a minute. Nexus 9 performance is around 8.8. We distinguish results for Andromeda and Android devices. Andromeda devices require higher performance score. This seems pretty straightforward. For this particular test, whatever Andromeda is requires more resources than Android. What becomes suspect here is the changelog for this file. Once you click it, you realize pretty quickly that this file has not been altered in over a year. AOSP (Android Open Source Project) is handled in a similar way to Chromium. The development of the core of Android is done right there in the open. It is searchable and available for anyone to see. If Andromeda were a thing and it had to do with folding Chrome into Android (as the WSJ article and Android Police suggest), surely we’d see some signs of Andromeda in either the AOSP or Chromium repositories. Guess what? We don’t. Not even a single mention. And to solidify that searching these repositories is pretty thorough, I’ll leave this link here that is searching the Chromium commits for changes to baseboard ‘Snow’, which was the board the original HP/Google collaborative effort Chromebook 11 was built on. In that link, you can see commits back to September of 2012. 4 years ago! It’s not like they trash this stuff after the device launches. It’s all still there. So, again, where is Andromeda? Let’s talk about a couple other issues I have with all this. First, Andromeda is referred to in the AOSP source code and is used in the main setup process in building the Android Image for a device. You can see it referenced here. It is not an operating system in this regard, for sure. Granted, codenames are a dime-a-dozen, so this isn’t really damning evidence. Just an example that Andromeda has been used before in very different contexts. Second, Marvell makes the Andromeda Box that was being tested for use in Google’s Brillo connected home initiative. You can see their homepage here. Here’s this one as well, referencing a project within Google called Andromeda. It is Google Cloud Platform’s latest networking stack. Again, I’m not saying that this is THE Andromeda being referenced by anyone, just that there are lots of Andromeda references floating around that have nothing to do with operating systems. Lastly, some personal conjecture here. The WSJ article mentioned above referenced a merging of Chrome OS and Android that would begin previewing late in 2016 and see full rollout in 2017. As we’ve talked about extensively here at Chrome Unboxed, the Android Framework is almost ready to go on Chrome OS. Apps run natively on the ASUS Chromebook Flip I am typing this on right now, and it is in the Stable Channel. No special developer settings whatsoever. And it works really, really well. Is there a chance that when all this began, when it was decided that Android would run on Chrome OS, that Google had Andromeda as a codename for this project? Absolutely. Might they have tested it on the Nexus 9 (what we see in that Java test above) to begin with? Sure! Could the WSJ article have been pointing to the exact thing we are seeing in front of our eyes right now? Yes! Late 2016 preview (only 3 devices have it right now. It is literally in Beta Preview) and a full rollout by 2017; that is what the article claimed over a year ago. Timelines change and we’ll see Android Apps on Chromebooks much sooner than they originally expected, perhaps. But you have to admit, this lines up quite conveniently. And, yes, I realize the year-old article mentioned “folding Chrome OS into Android,” but listening to the announcement of Android Apps on Chromebooks at Google I/O, it is clear that the idea of doing it the way we are witnessing right now was actually quite new in the early parts of 2016. I don’t think they knew exactly how they would pull this off back when the WSJ article was written; only that it was going to happen somehow. In the wake of the hype that is building for Google’s 10/4 Event (good job BTW, Google), I think we have jumped the shark a bit as an anxious consumer base. The dots being connected around Andromeda simply don’t point to anything real. 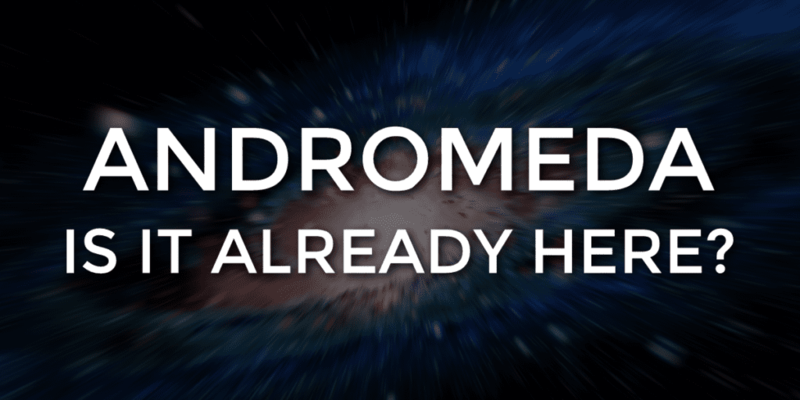 There’s no hard evidence at all that Andromeda wasn’t just a project codename that was applied to the Android/Chrome OS union we are seeing right now. I’m with the masses. I want to see a smooth, coheasive, singular experience from Google. I think it is coming, and I think the 10/4 Event is going to be the launchpad for that initiative. I think it is going to be big and epic. I’m excited and I’m really anxious to see what goes down. I just don’t think there is a magic, hidden OS that will suddenly appear to save the day.